See how you can use this secret to potentially turn a small stake into as much as $1.19 Million Starting on April 28th. 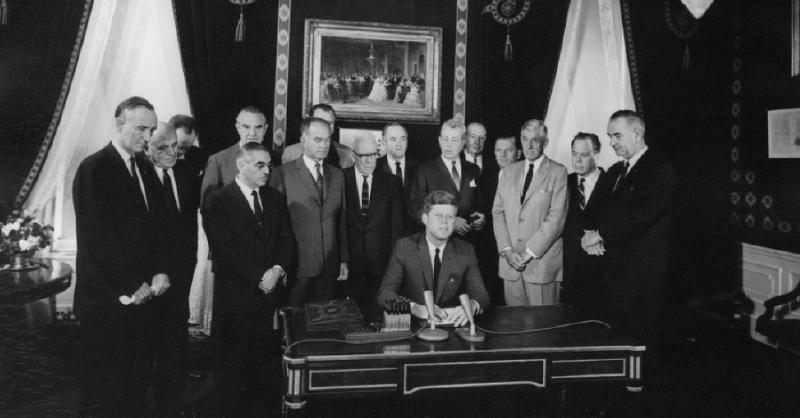 Every single historian is eager to credit President John F. Kennedy with great achievements such as the advancements of civil rights, averting a nuclear war and the promise to put a man on the moon. A few historians will even give him credit for his economic reforms … such as slashing taxes for the wealthy by 25%. But not a single historian has given him credit for jumpstarting one of the most lucrative investment programs in history. Yet this program is so profitable, I expect it played a strong role in fueling the Kennedy family fortune to over an estimated $1 billion. The Clinton’s revealed in their financial disclosures that the “first step” of this little-known investment program generates over $109,000 per year for them. Warren Buffett himself — the Oracle of Omaha — credits part of this program with his vast wealth. And according to Bill Gates’ SEC disclosures, at least $1 million per day can be traced back to part of this program. And here’s the thing … these elites have only taken advantage of part of this program. You’ve likely never heard of these Kennedy Accounts before, because — despite being made for Main Street Americans — the moment they came into existence, government officials and their cronies on Wall Street blocked all efforts to even mention their existence to the public. But now, word is finally leaking out. But just because they don’t want you to know about them doesn’t mean you can’t legally access them and profit just like the Kennedys, Buffett, the Clintons and Bill Gates. Indeed, those Main Street Americans who’ve discovered these Kennedy Accounts are making out like bandits. 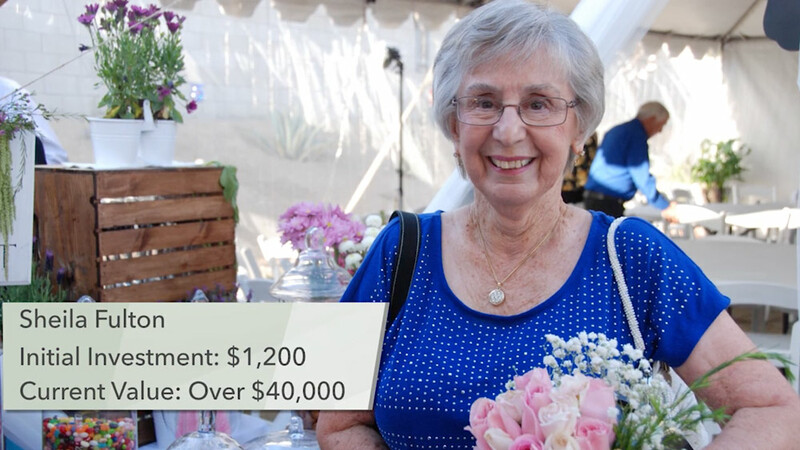 Take IRS agent Denise W. She was an average person making an average wage until she stumbled across this secret while reviewing wealthy tax filings and decided to try it out herself. 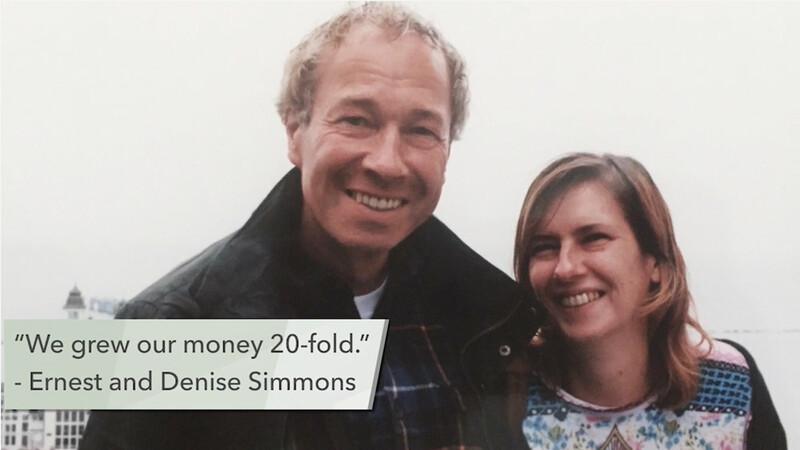 She grew a $1,841 stake into $10 million. Then there’s Maurice and Theresa Brooks — a couple entering retirement in Hartford, Connecticut. They grew a $122 stake into nearly $100,000. These Kennedy Accounts also made it possible for a 26-year-old Postal worker named Samuel Murphy to turn just $45 into $60,000. 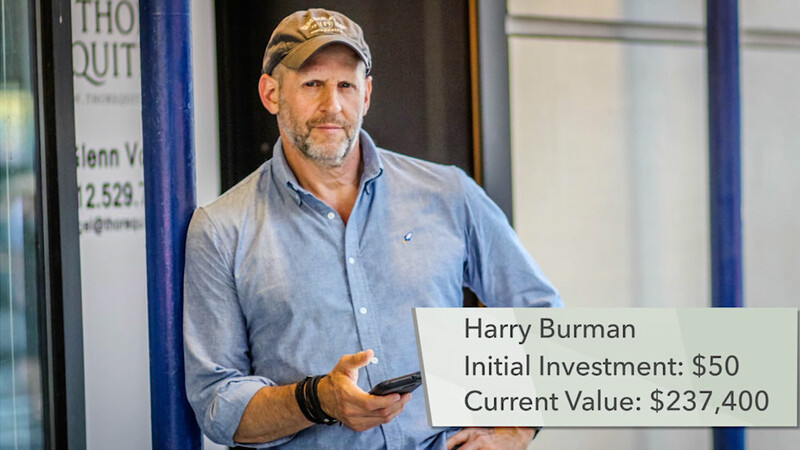 Now to be clear, they’ve added to these accounts over the years increasing their initial stake – what you get from this depends on how much you invest – but the potential here is too big to miss. Fact is, despite Wall Street’s effort to keep these Kennedy Accounts behind a velvet rope, anyone can use one of these "accounts" to set themselves up for a fortune. Which is what makes the fact that they are practically outlawed even more stunning. 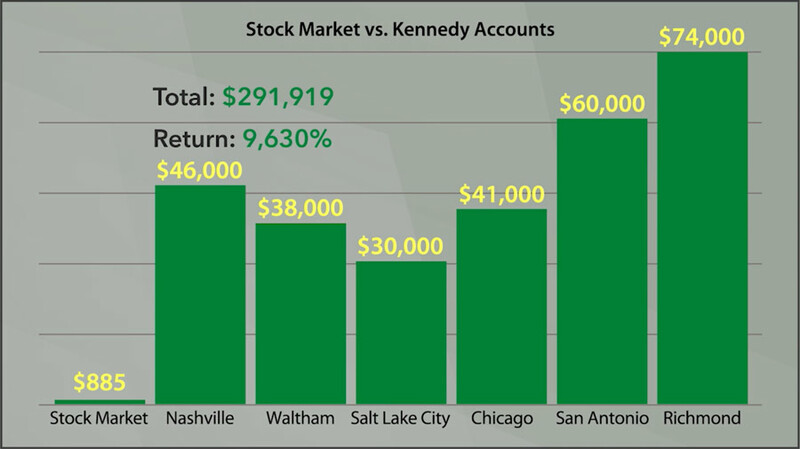 Over the next few minutes, you’ll see exactly why these "Kennedy Accounts" are such a dynamic investment tool for Main Street Americans, and why they are better than IRAs, 401(k)s and every other concocted retirement account out there. 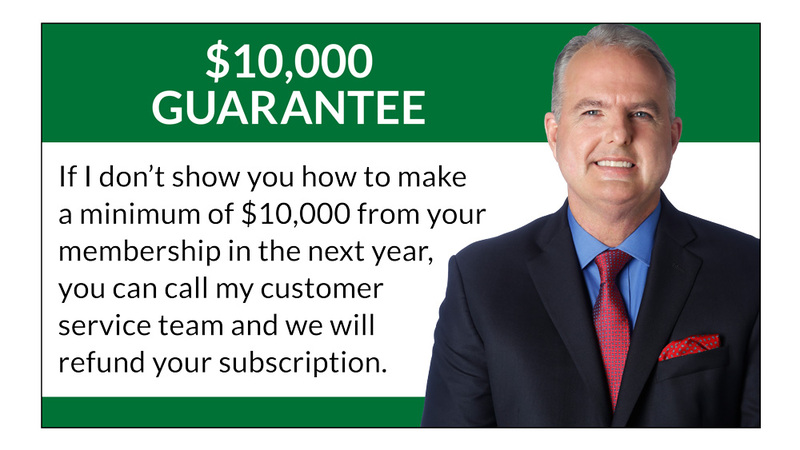 You’ll get a breakdown of exactly how to get started … I’ll even give you information on the phone number to call and forms to fill out so you can hit the ground running today. In fact, I’ll show you one Kennedy Account that would’ve turned a mere $500 into a $1.19 million windfall … and how you could potentially make the exact same gains if you invest before 25th. William Fein is living proof. He’s the gentleman who inspired me to look closely at these Kennedy Accounts when he mysteriously started giving away millions of dollars. William came from a humble background. He was the first in his family to graduate from high school. After serving in the military, he returned home to Vermont. He spent the next 25 years as a gas station clerk and then janitor at a department store. 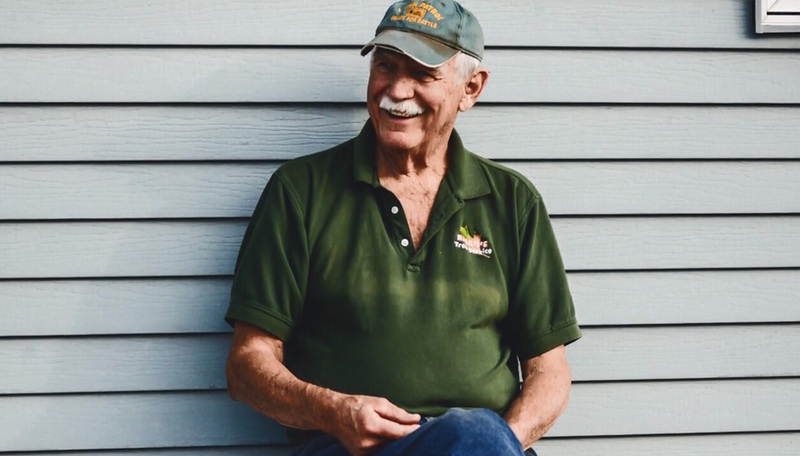 He was frugal … cutting his own firewood, driving an old Toyota, and wearing the same, threadbare flannel shirts to the local library that he frequented. Most people felt sorry for him. rather than wasting money on things that most consider luxuries, he was taking every penny he could and investing it. Over the years He quietly amassed an $8 million fortune. The townspeople were shocked when William began making massive donations to the local hospital as well as to the library. And now, the library itself expects a part of the “kennedy accounts” to continue giving in the years to come. Of course, we always wonder if a few fantastic stories can be repeated … can you, or I, do what William Fein did? What the IRS agent did … turning $1,841 into $10 million? What the retired couple from Harford did … turning $122 into $100,000? This question spurred me on a quest … one that involved discussions with hundreds of men and women, all who shared their personal results using these Kennedy Accounts with me. And I’m going to share their exact results with you in a moment, as well as a virtually fool-proof plan to help you make identical profits. But first, let me tell you a bit about me … and how my relationships with some of the world’s top investors such as Steve Forbes and Warren Buffett led me to the discovery of these Kennedy Accounts. And why I now consider these accounts to be the single most powerful way for an investor — regardless of how much or how little they have — to multiply their wealth 10-fold over and over again. If my name sounds familiar, you may recognize me from my time at The Nightly Business Report, where I received an Emmy nomination for my investigative work. As a financial journalist, I built my entire career around speaking with the powerful, the influential and the informed to get to the bottom of things. For instance, I’ve had the chance to speak with Warren Buffett, the Oracle of Omaha himself, in multiple exclusive meetings. I was one of the few admitted into Cuba after the fall of the Soviet Union to discuss economic relations with the late Fidel Castro. And political heavyweights such as Donald Trump, Mitt Romney, Bill Clinton and Sarah Palin — to name a few — frequently visited my company’s office. 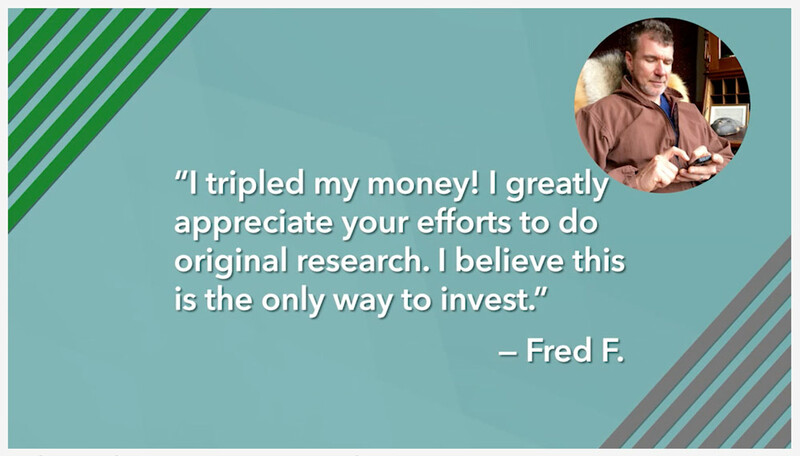 And I’m happy to say that my research and industry contacts have provided me the financial wisdom I needed to make some incredibly profitable moves over the last few decades. For example, on just one of my big wins, I managed to make a gain of 833% … turning my investment of $180,000 into a $1.5 million windfall. In another instance, I invested in a sportswear company most of Wall Street had written off — only to walk away with a 500% gain … turning every $10,000 into $60,000. It’s gains like these that have helped me provide my family with the life we’ve always dreamed of ... living in a beautiful house within walking distance from the beach in one of the most sought-after parts of Florida. But I recognize most Americans haven’t had the same experiences I’ve had, and therefore haven’t enjoyed the same level of financial success. So, I decided to take all the knowledge and insights I’ve gained over the years … and pay it forward. I left my job at one of America’s biggest media conglomerates to help start a boutique research company two years ago … forming a team with some of the most brilliant minds in the financial world. Our team includes a former U.S. congressmen and bestselling author, a famed economist and advisor of presidents and world leaders, a Wall Street legend and multibillion-dollar hedge fund manager, a former nuclear missile architect who is paid to train professional traders and many other world-class financiers who are top experts in their fields. At our company, we offer Main Street Americans the chance to tap into the minds of our experts… to help them turn even a modest net worth into millions. 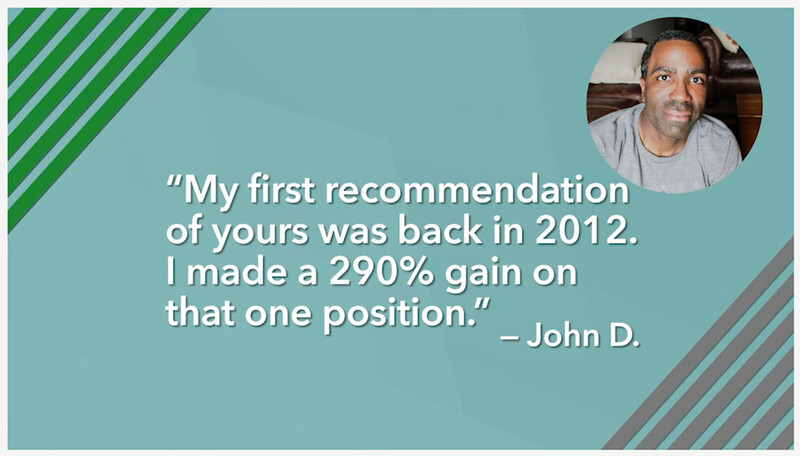 Thousands of people have already seen gains as high as 127% … 192% … 225% … 252%… 340% … 517% … and 760% in just a few years or less by following our research. 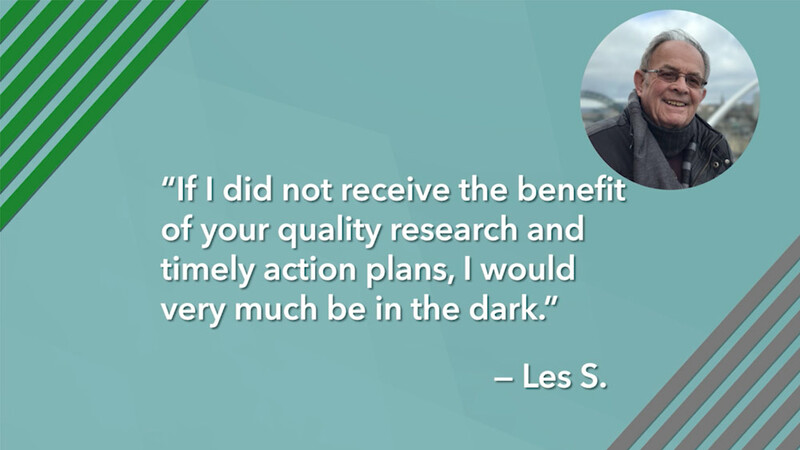 I get no greater joy than to hear from people like Louis, Mike, Fred and so many others who have been able to transform their lives, thanks to our research. Another gentleman even sent us his brokerage statement, revealing how he made over $995,000 by following our investments recommendations. However, while our team has produced some phenomenal winners in the past, I believe our recent discovery of Kennedy Accounts could eclipse all our previous achievements. 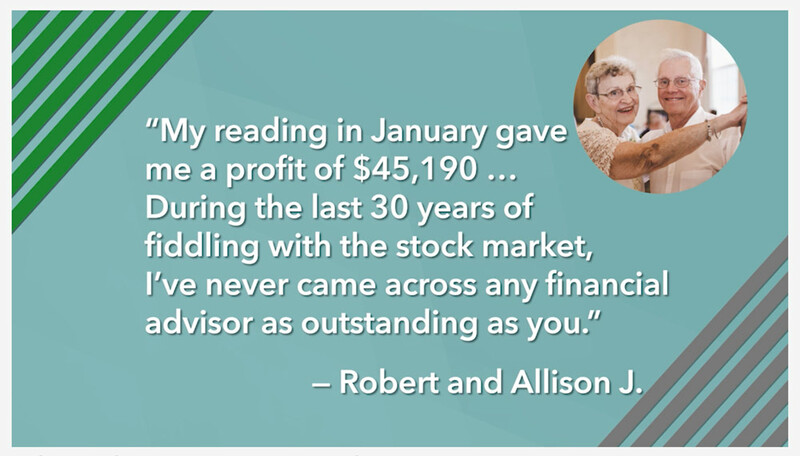 In fact, a few months ago I asked readers if they’ve heard about the investment vehicle behind “Kennedy Account” and they were singing praises about their results. Each of these folks took the time to start their accounts and watched them grow over the years to something life changing. And there are dozens of other examples of people who wrote in telling me how much money they have made, and continue to make, since they used these Kennedy Accounts. As you can imagine, I’m glad I mentioned these accounts to these folks and that they are making money hand over fist. It’s your turn to find out how it’s possible to turn a $50 stake into as much as $50,000, $100,000, or perhaps even as much as $200,000 over time. You’ll be shocked by how easy it is to get started. 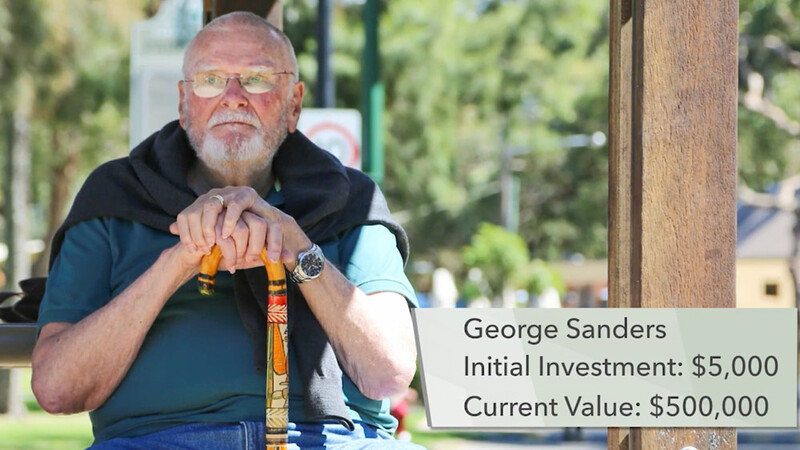 Now I’ll be the first to say nothing in the market is guaranteed, what you get from ‘Kennedy Accounts” all depend on how much you invest – but I’m sure the potential here is clear to you. Better yet, this investment has no ties to the government. You simply invest in the right companies and watch your wealth roll in. And, it’s vital you get the details before the 25th of the month for your chance at the absolute maximum returns … including the chance to potentially snowball a $500 stake into as much as $1.19 million. 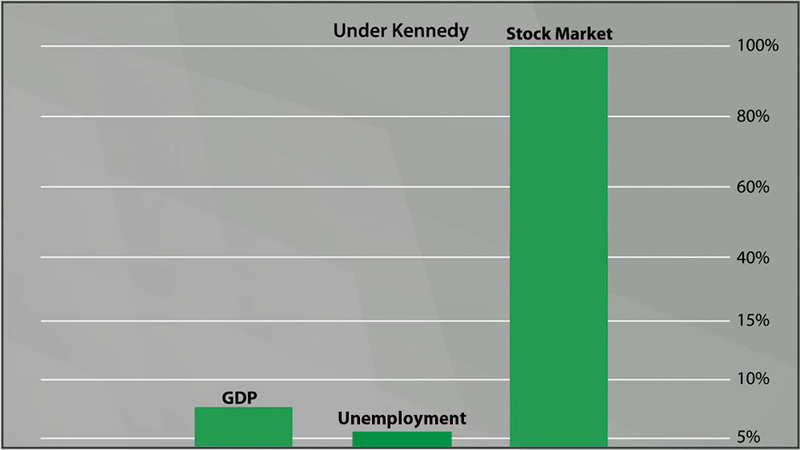 You see, when Kennedy was running for office, the economy was stalling. The stock market had dropped 13%. As soon as he took office, he cut taxes by as much as 25% and pushed through dozens of measures to fuel an economic boom. 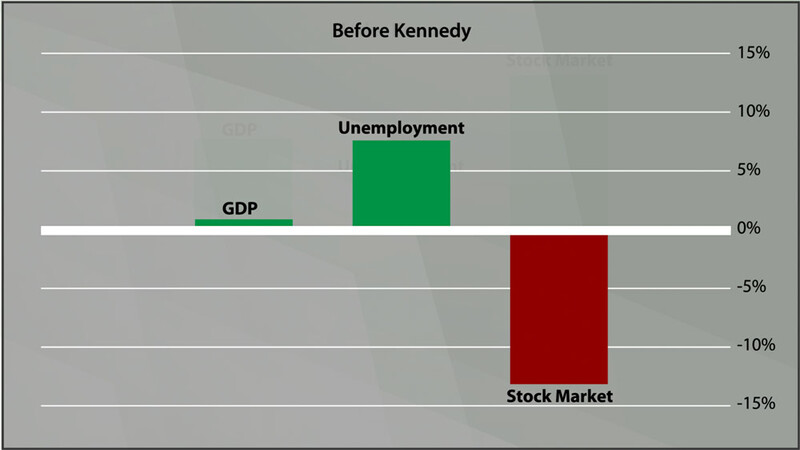 Most historians don’t credit Kennedy for these economic reforms, but by his untimely death, the economy was surging. GDP was growing at a 6.6% annual clip. The unemployment rate had been cut nearly in half, shrinking to a mere 3.8%. And the stock market had doubled. But he knew it wouldn’t be enough. Being the son of Joseph Kennedy … the first SEC chairman … John F. Kennedy appreciated the power of the stock market. He knew that if he wanted the economy to roar to life, he would have wanted to find a way to make sure Main Street Americans would gain the ability to bolster the economy. So it’s no surprise that in the early ‘60s work began on a program that would help taxpayers funnel billions of dollars into American enterprise … a program that would benefit big corporations and investors on all levels. The result was the creation of what I’ve been calling "Kennedy Accounts." Filed under IRS Code 852, a Kennedy Account is a program that allows people to invest directly into thriving companies. The key word is… directly. 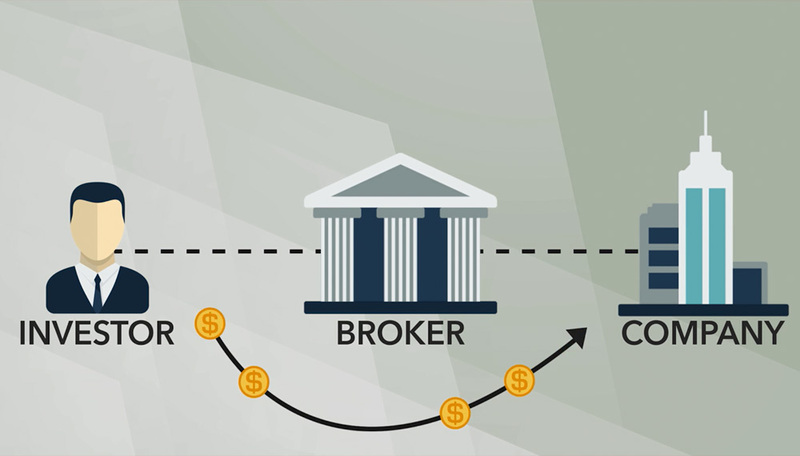 Instead of investing through a middleman … such as a broker, who takes a big cut of every single transaction … the company would be able to open a Kennedy Account for the investor in-house, allowing him to buy shares of the stock directly. 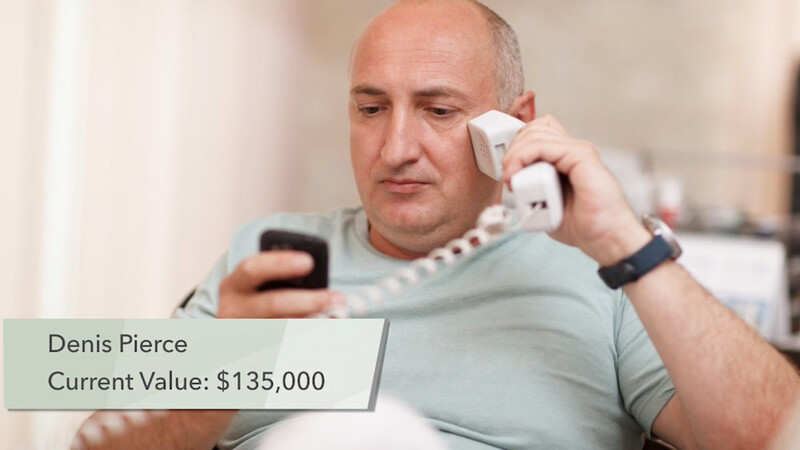 Brokerage fees — which unbeknownst to most, range from $20,000 to as much as $500,000 for the typical person over their lifetime — could be eliminated. And that’s not even the biggest advantage of these Kennedy Accounts. The company would also be legally allowed to give favorable treatment to investors who had these accounts, such as a massive reduction in the share price. They would sometimes slash as much as $5, $10 or even as much as $25 off the stock price … imagine getting a $100 stock for $75. That’s like making an instant profit. Plus, the company could allow investors to buy as many or as few shares as they wanted. So, they could set themselves up on an automatic purchase plan of $20, $30, or $40 a month, for example. However, before Kennedy could highly publicize these accounts, he was assassinated. Few people ever heard about them. And that’s just what Wall Street would prefer. As you can imagine, these Kennedy Accounts meant brokers would lose out on a mountain of money…. if only 1,000 people saved $500,000 that’d be $500 million out of Wall Street’s pocket. After all, who is going to pay a broker to purchase shares of a company when they can do it themselves and get a massive discount on the stock price? So it’s not surprising that as soon as the Kennedy Accounts came into existence, the top financial powers marshalled their resources and lobbied Congress — as well as the SEC — into concealing their existence. They flat-out prohibited the companies who chose to offer them from even advertising their Kennedy Accounts to the public. So, Kennedy Accounts have quietly remained in existence, with a number of thriving companies quietly offering them … yet few investors have ever heard of these accounts as the companies are not allowed to promote them widely. That’s why when I discovered them, I knew I had to do something. So, I put this video together so that you too can have the chance to profit! 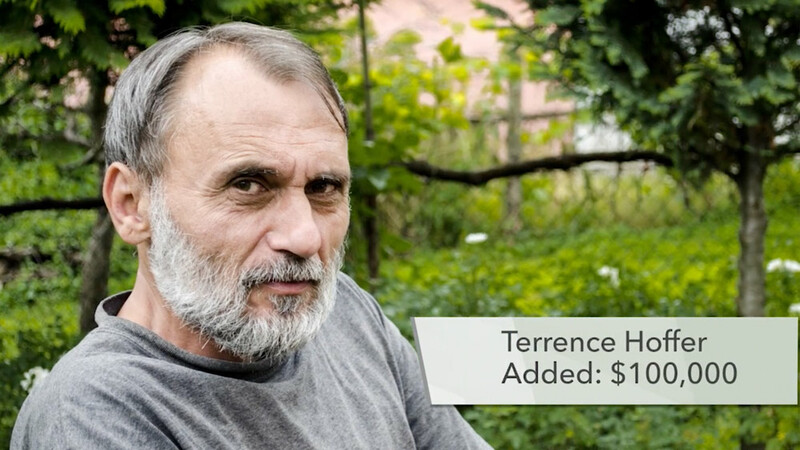 Anthony Eldman from Wichita, Kansas, made a 6,900% return. Marissa Rayman, grew her money 2,400%. 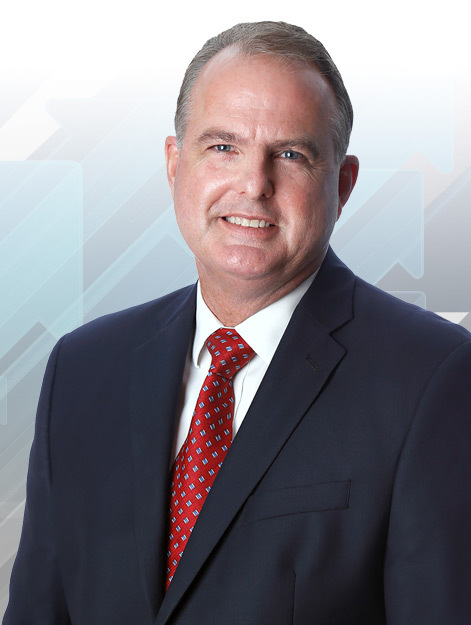 Harlan Adams says his investment boomed 2,584%. 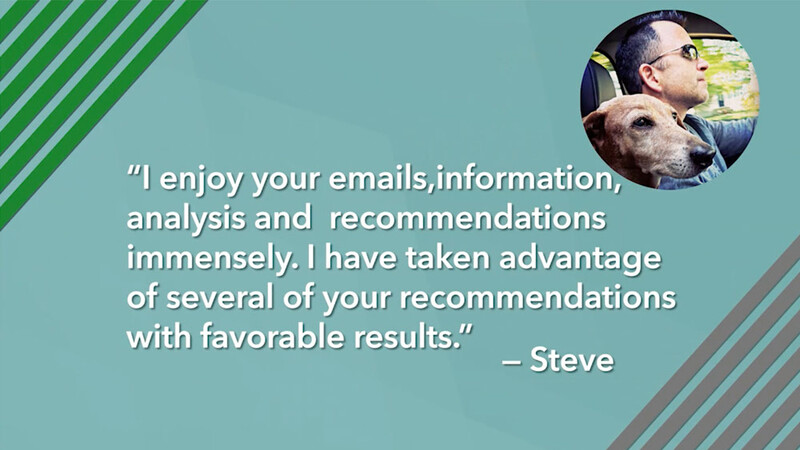 Aaron Deacon, from San Francisco, California, was thrilled sharing the results of his investments with me. What he wrote is hard to believe. His account grew 18,900%. I have dozens of people on file who eagerly told me how these Kennedy Accounts were a windfall for them … creating tens of thousands, hundreds of thousands and even millions of dollars. It’s your turn for the chance to make gains of 2,500%, 2,400%, and 6,900%. But you will want to get started before the 25, to position yourself for the absolute biggest returns. Take this company out of Nashville, Tennessee for example. It generates nearly $3 billion per year by running gift stores, and a good chunk of that revenue funnels right back to those who enroll in their Kennedy Account. Let’s say you put just $500 in the account on January 2000. Your $500 would now be worth $12,007. Not bad for small stake to test the waters … especially considering the stock market would have turned the same $500 into $885 during the same period. 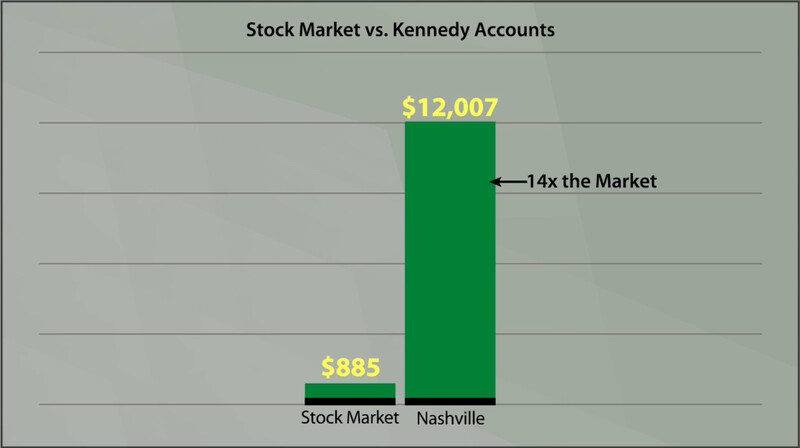 Meaning a "Kennedy Account" returned 14 times more than the market. 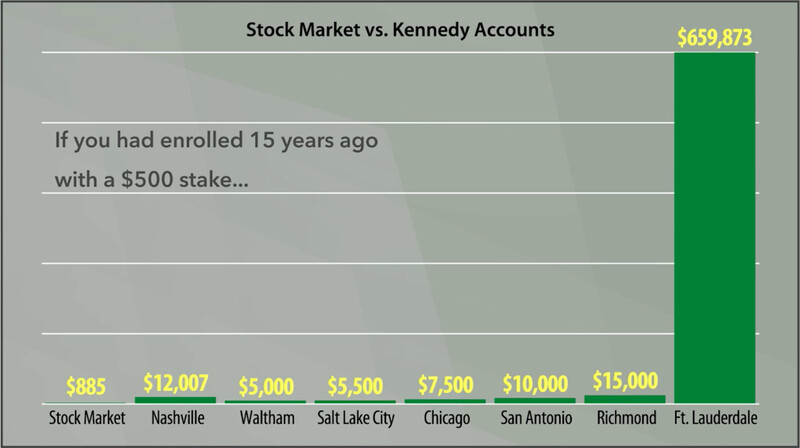 There are several Kennedy Accounts that have 10-fold returns. Over the last few years, a Kennedy Account with headquarters in Chicago, Illinois would have snowballed your $500 stake into $7,535. One in San Antonio, Texas could have catapulted it to $10,138. And a Kennedy Account stationed in Richmond, Virginia would have turned it into $15,226! 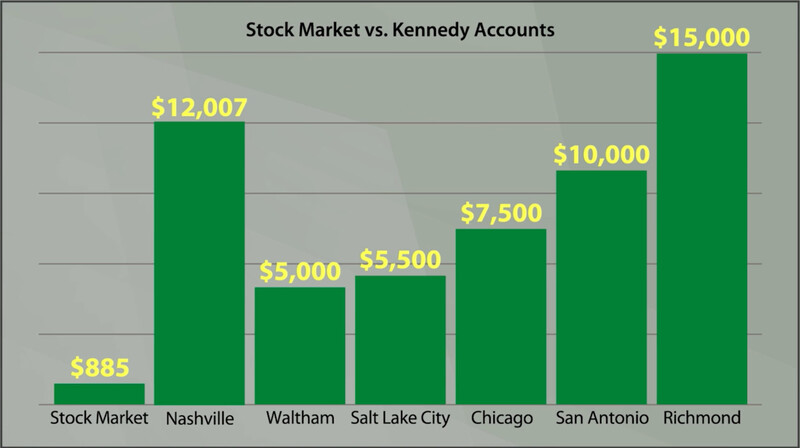 But if you only invested $500, and never did anything else, you’d be missing out on the true power of these Kennedy Accounts. Remember, you can put as much or as little as you like into these accounts, and potentially grow your money exponentially. So, if you merely added an additional $40 a month — the equivalent of $1.29 a day — the effect is massive. Suddenly your $500 in the Nashville account would be worth $46,000. The Waltham account would skyrocket to $38,000, the Salt Lake City account would balloon to $30,000, Chicago would go to $41,000, San Antonio to $60,000 and Richmond to $74,000. 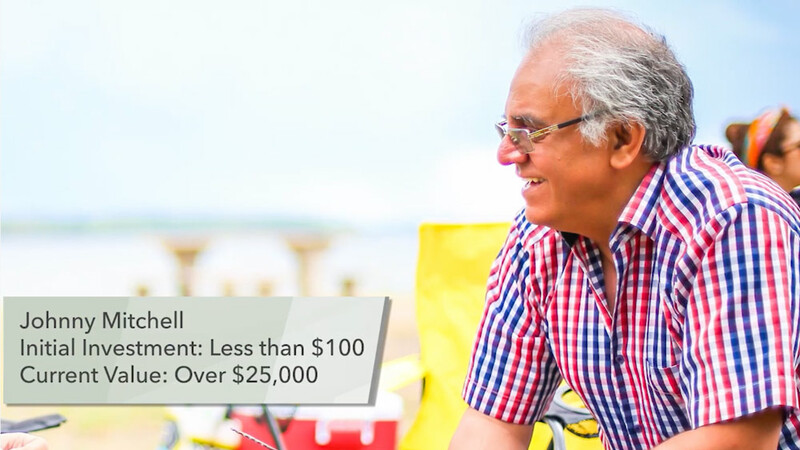 Keep in mind, the average retirement savings is about $95,000. So you would already have three times more than the average American has set aside for retirement. That is the true power of Kennedy Accounts. Now my examples are assuming spot on timing, but even if you only did half as well that’d still be enough to change your life. Again … after talking with my readers about these Kennedy Accounts … folks who are no different than you are … I have received dozens of letters from them telling me how much money they made. Can you imagine if you had started with $5,000 in the same investment? It’d be worth $1.2 million. 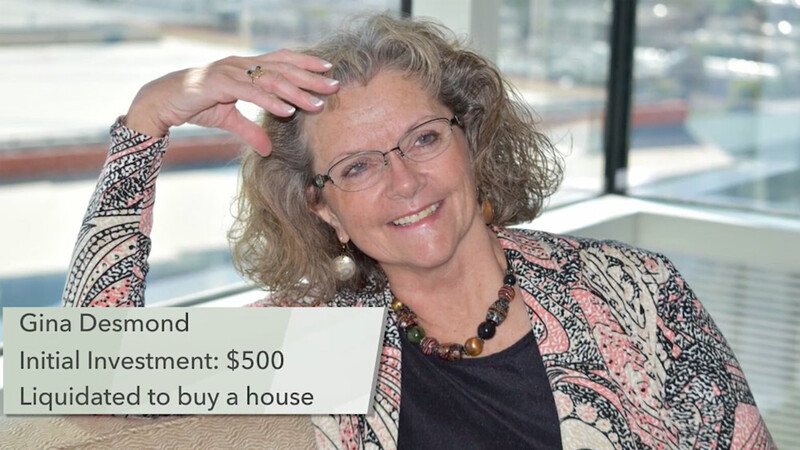 Enough to buy a house, pay off debts, take vacations multiple times a year … you name it. These are legendary gains, and yet, I have a small file of men and women who have enjoyed them … without any sort of speculation of swing-for-the-fences style investing. Now I’ll be the first to say that nothing in the market is ever guaranteed — but my examples ought to speak for themselves. The potential here is enormous. 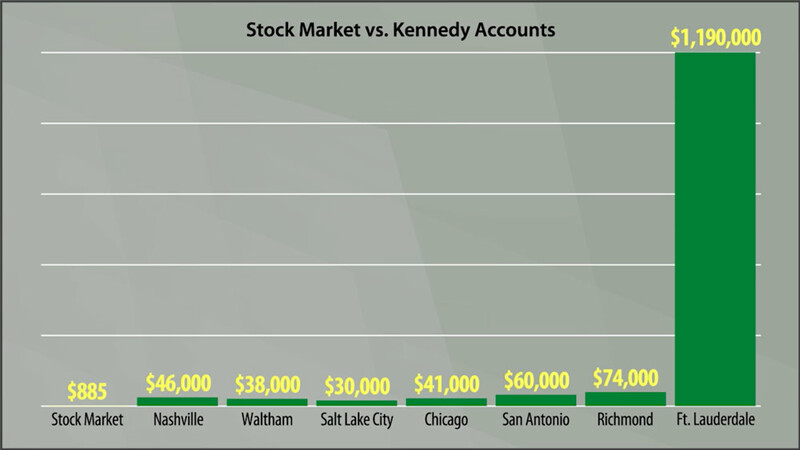 I truly consider "Kennedy Accounts" to be the single greatest tool in any investor’s arsenal for sure-fire wealth. Because with hardly any work at all — and starting with just the smallest amount of money — you can amass a six-figure windfall. I haven’t shown you examples of the best "Kennedy Accounts," the ones I personally recommend. 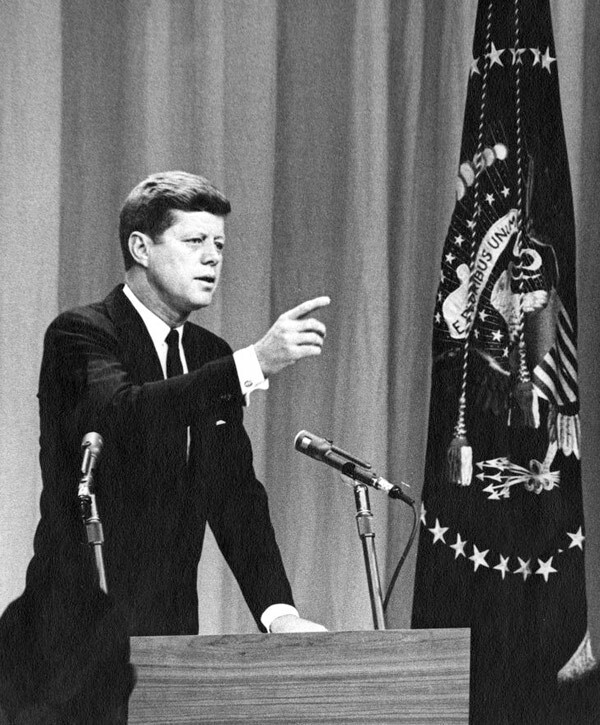 I’ve put my firm’s team of analysts to work … including two Chartered Financial Technicians and a former Hedge Fund manager … and after three years of research, we can confidentially say that we’ve found the top five "Kennedy Accounts" to grow your wealth exponentially. This "Kennedy Account" operates out of Fort Lauderdale, Florida. And while it has quietly been in business since 1990, becoming one of the largest financial organizations in the South Florida region, it began making some truly stratospheric leaps in the last few years, raking in nearly $700 million annually. Let’s say you enrolled in it about 15 years ago with a $500 stake just to test the waters. All told, your $500 in this Kennedy Account would now be worth $659,873. That’s 963 times more profit than the top five year certificate of deposit. It is 511 times more than the average 401(k). And 449 times more than the stock market. Starting with just $500. That’s a 131,874% return. And just like with the other Kennedy Accounts, if you would have added a modest $40 a month … the returns would have been exponentially larger. Turning that $500 into as much as $1.19 million. Tell me, have you ever seen an investment that could make anywhere near this profit starting with $500? This is why I consider Kennedy Accounts the No. 1 way for any investor … whether they start with $50, $500 or $5,000 … to become obscenely rich. And here’s what really thrills me. My team and I have found four other companies offering Kennedy Accounts with the same potential. But my research suggests if you get them before the 25, you’re looking at the same potential that folks had getting in the $1.19 million retirement miracle. They could set you up for hundreds of thousands, if not millions, depending on how much you choose to invest. 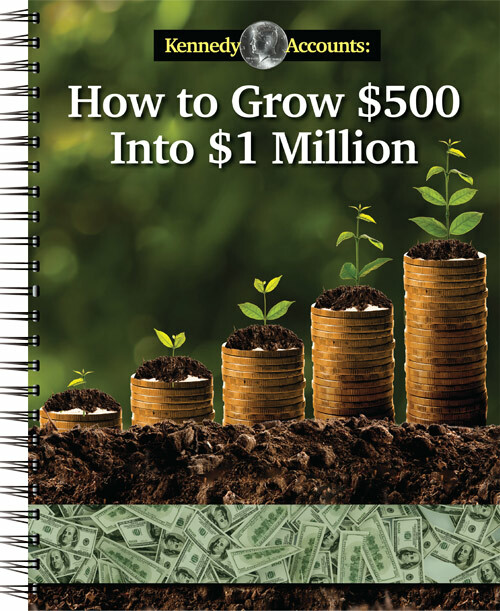 Kennedy Accounts: How to Grow $500 Into $1 Million. In this private document, I outline the five best Kennedy Accounts for the biggest growth. And I’d like to send it to you free of charge. Understand … each of these accounts were heavily vetted by me, as well as my most trusted colleagues. Continued devotion to increasing returns. The ultimate goal was to pinpoint the top five Kennedy Accounts that not only could grow your money by leaps and bounds — 10-fold at minimum — but could do it with as little risk as possible. After sorting through 572 existing Kennedy Accounts, I’m proud to say we did it. 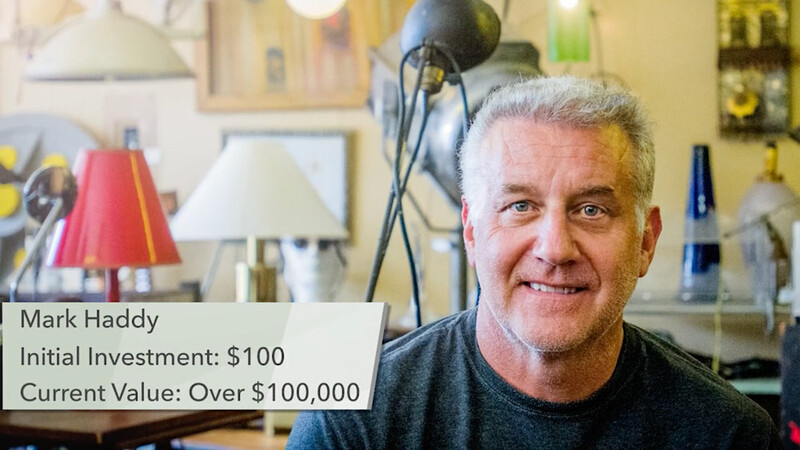 In Kennedy Accounts: How to Grow $500 Into $1 million, we give you our top five accounts. I already told you about the $1.19 million miracle. The four other accounts are just as impressive, if not more so. For example, when the 2008 crisis hit sending stocks down by 50%, these accounts remained stable and one of them even increased in value. Another account essentially lets you make an instant 5% gain upon the purchase. What other investment gives you that kind of instant boost? And this report doesn’t just outline our favorite accounts, it’s also a complete explanation of how to get started. Who you need to contact at each organization to get an account set up. I’ll even show you how easy it is to fill out an enrollment form. How much to invest for the biggest return. You can start with as little as $50 if you would like in some of the accounts and still make a bundle of money. How much you can expect to make in your first year, the next five years, and even 10 years. As you can imagine, I could charge hundreds, even thousands, for a report of this caliber. After all, we’ve put hundreds of thousands of dollars into the research behind it. However, I’m giving you a copy of this document free of charge. And I’m not going to stop there. As mentioned, my team and I do a ton of research. And in that research, we found two additional investments that are just as big of opportunities as Kennedy Accounts. The Secretary of Defense admitted that this threat was an imminent “Pearl Harbor” that could potentially trigger the next global conflict. And while individuals are often victims, the biggest targets are governments and global companies. Hacking into their data exposes millions of credit cards, social security numbers and personal information. Which is why these organizations will be spending $1 trillion to fight cybercrime in the next two years. And the security company I’ve identified is at the forefront of the situation. I expect it to grab lion’s share of the trillion dollars being spent. In fact, half of the Fortune 100 companies have already begun turning to them — such as Pfizer, Barclays, Fannie Mae, Time Magazine … and dozens of others. 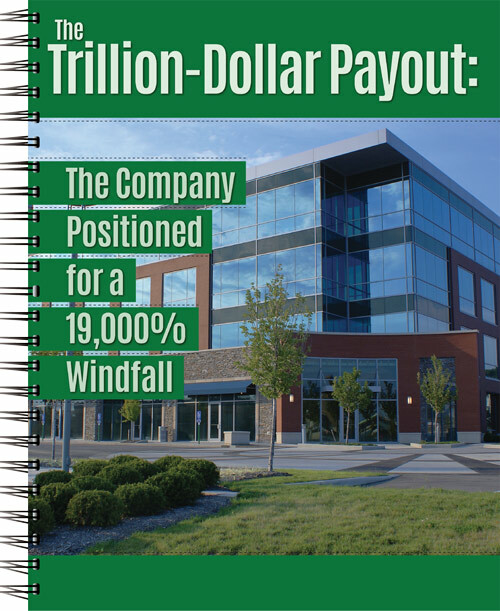 In my report, The Trillion-Dollar Payout: The Company Positioned for a 19,000% Windfall, I lay out every crucial detail, so that you can profit from this company. You will discover the true nature of this firm’s revolutionary cyber-defense software. You will see exactly why it will continue to race ahead of all other companies in the field. You’ll get the exact mathematical breakdown of why this tiny company is set to see its shares rise upward of 19,000%. And I want to send you this confidential dossier free of charge. As you have likely seen, bitcoin is all the rage. It has gone parabolic. A $100 stake just seven years ago would now be worth $600 million. Yes, you read that correct. And bitcoin is far from the only cryptocurrency making investors rich. $100 invested in Ethereum would’ve turned into $30,000. SibCoin would’ve snowballed every $100 into $60,000. And Nexus which catapulted to $100,000. It seems that a new cryptocurrency is popping up every day … currently reaching 1,000 various currencies. However, I strongly suggest you avoid bitcoin … as well as every other digital currency. That’s because the digital currency craze reminds me of all the speculators who tried to strike it rich mining for gold in California back in 1849. The only people who really made money were those selling the “picks and shovels” to the miners. And I’ve identified three of these companies! You will get all the details about it in my new report titled Better Than Bitcoin. These are bedrock investments that will make cryptocurrencies a real part of the global economy, and you can buy them right through a regular brokerage account. These are the investments few others are watching, but have been quietly exploding in value. Since 2010, one of these companies has soared upward of 1,500%. And this is still just the early innings. As technology and pervasiveness of digital currencies accelerate … the returns can only go higher. And this report is yours at no cost. While I could easily charge upward of $199 for each of these reports, I don’t want you to pay one red cent for them. 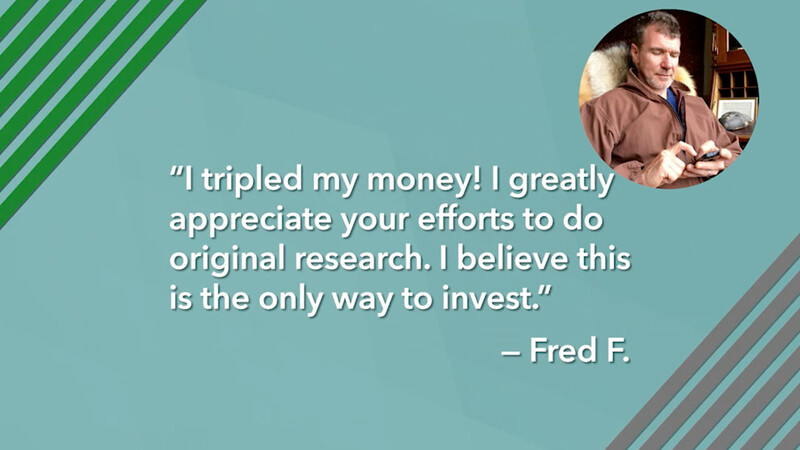 I want to give each of them to you for free when you try out my award-winning research service Total Wealth Insider. This is easily the biggest opportunity in front of you today. 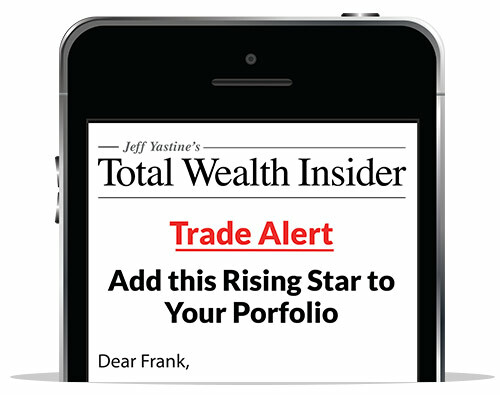 Total Wealth Insider is an incredibly unique service that allows you to look over my shoulder and see my top investment picks, meet my business contacts and get my insights on the markets. You will get access to my model portfolio. This simple to read portfolio tells you what stocks I recommend you buy, hold and sell. It’s really simple to read and use. All kinds of investments are in this portfolio. Not just Kennedy Accounts, Cybersecurity stocks, and Cryptocurrency plays … but also precious metals, retail companies and more. Nothing is off the table. 159% in ENN Energy Holding. 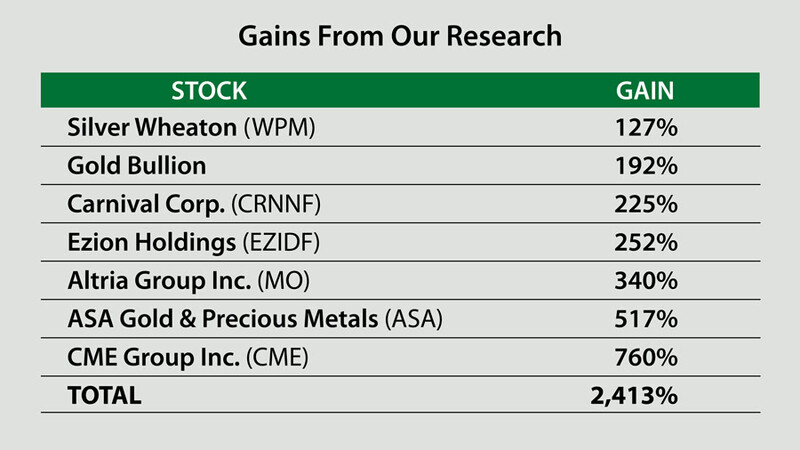 As you can see … gains like these can be yours as well when you become a member of my Total Wealth Insider service. 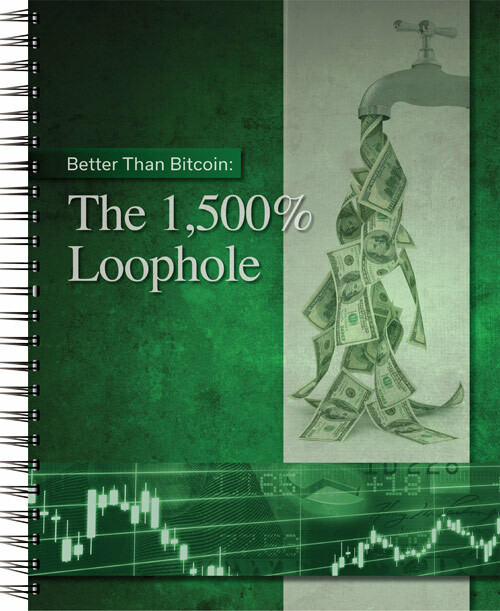 Every month, you’ll also receive an 8-page dossier that thoroughly describes my latest investment recommendation, why I’m picking it, and the gains I expect folks can seize from it. Regardless of whether it’s investment opportunities in technology or income, real estate or retail, or any other sector of the market, I devote a minimum of 50 hours each and every week to unearthing these potential windfalls. 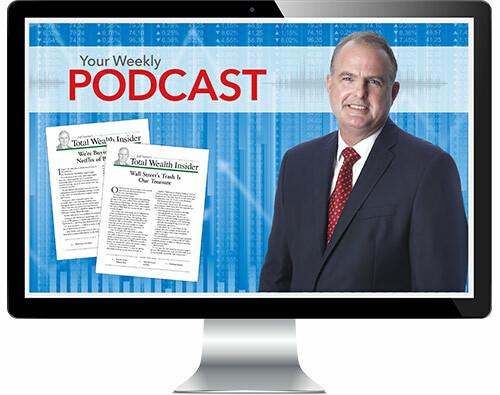 Each note also reviews our open positions in the model portfolio, gives a no-nonsense update on the overall stock market, the political climate, and any other factor that might factor into our investing. Every week, I’ll put together a special video presentation that I email out to you. In it, I review the positions in our portfolio so that you are always in the know. If I think it’s time to make a trade, I will simply email you. The trade alert will tell you what position to buy or sell, and at what price. And all you have to do is make the trade. Any time, any day, you can log into my encrypted Member’s Only webpage … read every report, every newsletter issue, review the model portfolio, or report a concern about your membership. You’ll receive confidential details via email. If you ever have questions about your membership, simply give one of my team members a call. They will walk you through whatever you need. 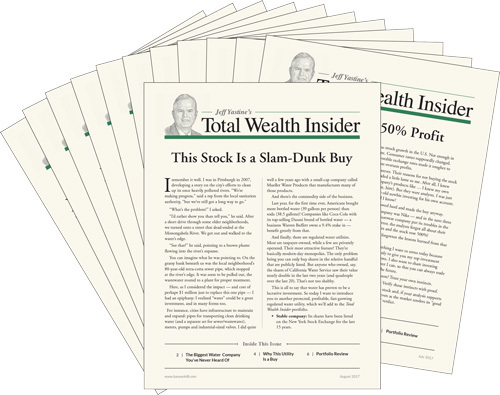 So, through Total Wealth Insider, you get access to me … my best ideas, my best stock recommendations and my best research. 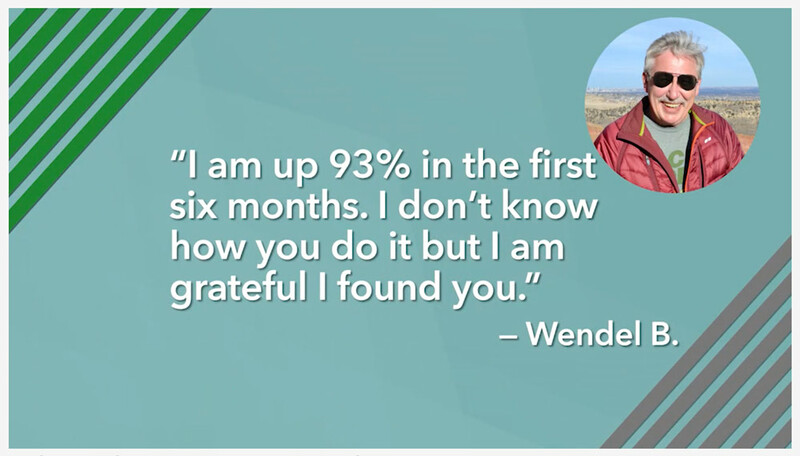 Over 50,000 people already have a membership to Total Wealth Insider, and they love it. Take a minute to listen to what they have to say about their experience. 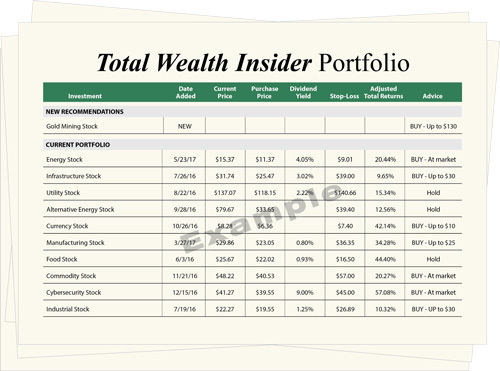 All the people you just heard from, they were once given the very opportunity that you are about to receive … the opportunity to try out Total Wealth Insider risk free. They jumped on that opportunity. I think you should do the same. If you do, I’m confident that you too will be writing in to me in the near future and sharing your incredible results … including everything you’ve done with all the unexpected money you’ve made… especially because I am equipping you with these three reports to help you get started. Helping you achieve an immense amount of wealth is my mission. 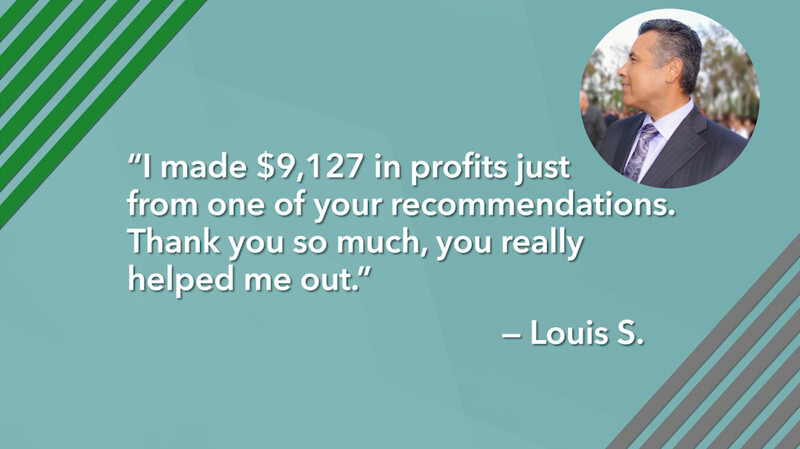 It brings me great joy to know that I can help others achieve their financial dreams. Which is why I have kept the cost to join Total Wealth Insider at the lowest price possible. So, I reduced the cost to just $199. I believe it’s a steal at that price. The three special reports I’ve promised you today have a $199 value each, and are worth $597 by themselves. And let’s not forget, the fortune you could make from the Kennedy Account, that could hand you as much as $1.19 million. But I want to go a step further. To eliminate any and all barriers that could prevent you from joining, here’s what I’ve decided to do. 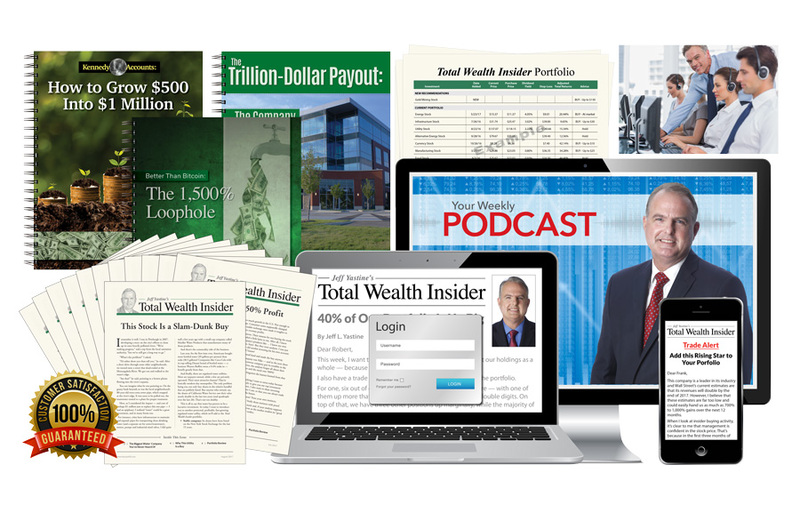 I want to make a one-year membership to Total Wealth Insider available to the first 1,000 people today for only $47. That’s about the same amount it costs to fill up your car. Frankly, it’s just enough to offset our cost to publish the service. But I know the feeling that comes with trying something new. 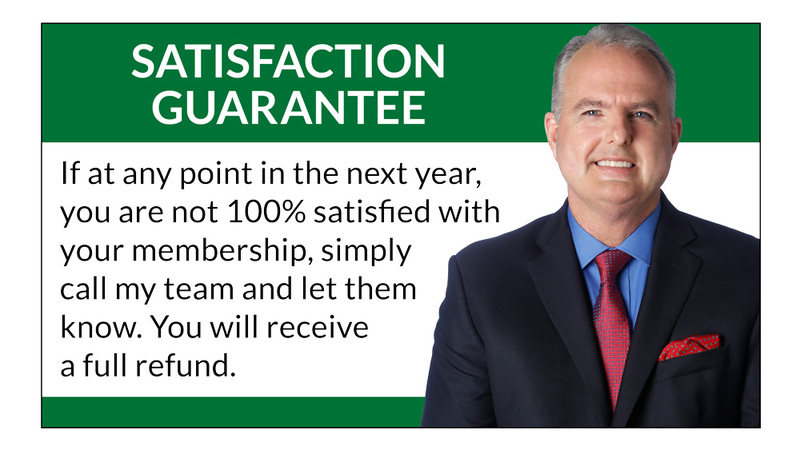 Which is why when you join today, you’ll receive two incredible guarantees. Now, it doesn’t get any better than that. 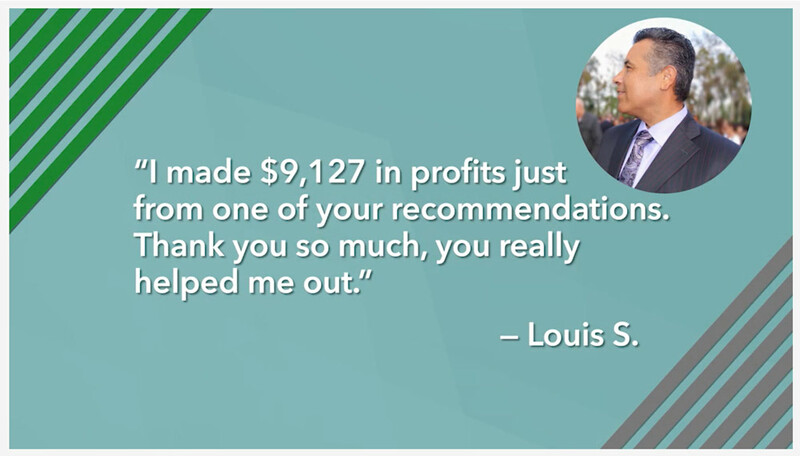 So if on the 364th day… you feel as if I wasn’t thorough, or if you decided to try the strategy out and see that you only made $9,999 from my recommendations, all you have to do is call my office, let us know, and you will receive a complete refund of your $47 membership fee. Plus, you can keep everything I’ve sent you up to that point, no charge. 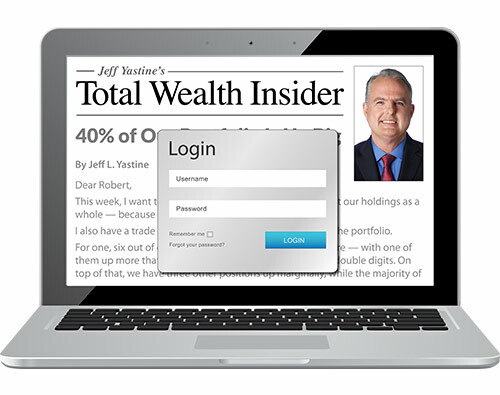 Just consider it my way of saying thank you for giving Total Wealth Insider a try. That said, I would be stunned if you did cancel. Nearly every day I hear from current members telling me how they now have a peace of mind about their investments, how they are making more money than they ever thought possible, and how they are frankly, having so much fun! 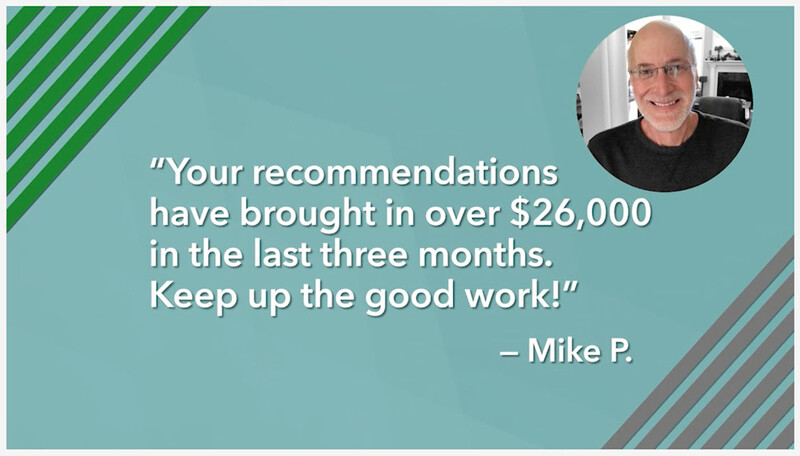 You’ve even seen how one person made over $900,000 thanks to my team’s recommendations. I expect you’ll be right there with them over the next few months. But you need to act today. These accounts are the key to an early retirement. 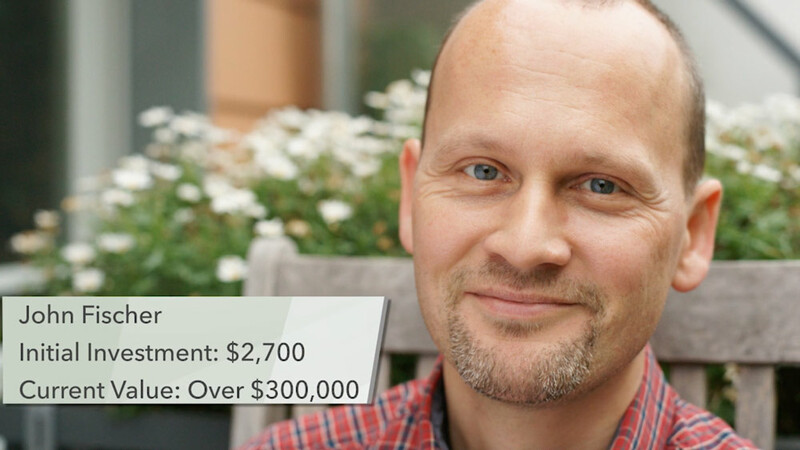 Tom Ingles told me how he is quadrupling his money. Jerry Lennon has seen his investments rise 23-fold. 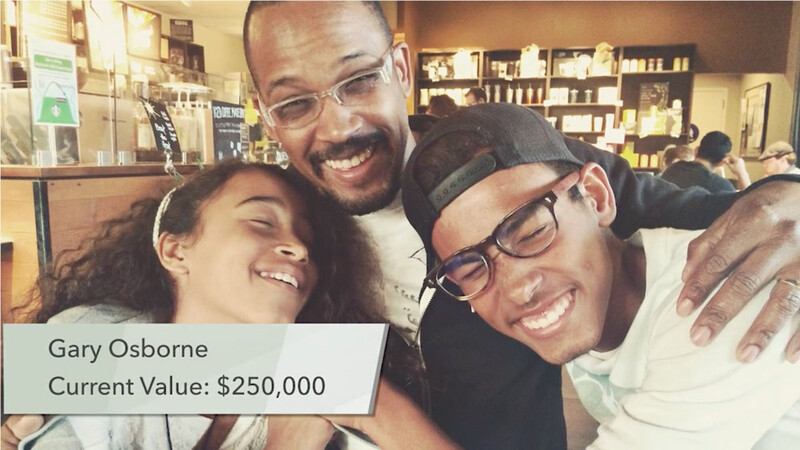 Then there’s Victor Robertson, who watched his account grow by $250,000. I even have a letter from Janice Grisman, who has seen her tiny stake grow 7,056%. This is what’s waiting for you when you begin harnessing these "Kennedy Accounts." And as you’ve seen today, one of the "Kennedy Accounts" in my special report has the potential to turn a mere $500 into over $1.19 million. Just ask Elliott Masterson, who has seen a $16,000 stake grow to $500,000. These same potential is ahead of you, right now. All you have to do to get started is click the button below. You’re not making any long-term commitment by clicking the button. I will take you to an order page where you can review everything you’ll receive before you move forward.